Purchase Limit: Promotions are limited to one per person. You may purchase additional for gifts. 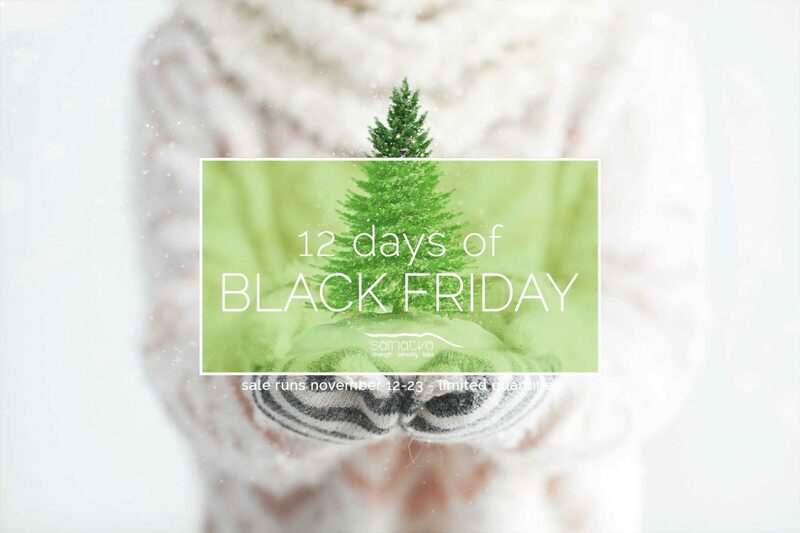 For Black Friday 2018 Sale, Samatva Yoga is offering 3 months of classes (3 Month Infinity Membership) for $185. That breaks down to $61.66 per month ($42.66 less per month than our $108 Infinity Month-to-Month Membership). This is an auto-renewing membership with NO COMMITMENT. This means that you will forever have a $185 3-month membership from term to term unless you choose not to – Cancellation is free + you do it yourself from your MBO profile. It’s that easy. NOTE: When purchasing, this package does not activate on the day of purchase, but on the date of your request (no later than January 30, 2019) — This way it can make a wonderful HOLIDAY GIFT!!! UPGRADE YOUR CURRENT MEMBERSHIP: If you have a current Infinity Membership with us + would like to upgrade to this new rate there will be a $25 admin fee to do the adjustments. We are unable to accommodate price changes for any previous purchases – all adjustments will be dated forward of Nov 24th. Existing class cards are non-transferable, sorry. ACT QUICK Limited memberships available at this price. – MUST ACTIVATE BY JANUARY 30 2019 – all errors will be adjusted. Please indicate start date during purchase set up. • + Earn Samatva $REWARDS for more free stuff! For Black Friday 2018 Sale, Samatva Yoga is offering a year of classes (Annual Infinity Membership) for $399. That breaks down to $33.25 per month ($74.75 less per month than our $108 Infinity Month-to-Month Membership). This is an auto-renewing membership with NO COMMITMENT. This means that you will forever have a $399 annual membership from year to year unless you choose not to – Cancellation is free + you do it yourself from your MBO profile. It’s that easy. For Black Friday 2018 Sale, Samatva Yoga is offering 6 months of classes (6 Month Infinity Membership) for $250. That breaks down to $41.66 per month ($66.34 less per month than our $108 Infinity Month-to-Month Membership). This is an auto-renewing membership with NO COMMITMENT. This means that you will forever have a $250 6-month membership from term to term unless you choose not to – Cancellation is free + you do it yourself from your MBO profile. It’s that easy. Please be sure to include quantity for +1 orders. Orders will be fulfilled by December 20. Pick up at preferred studio location. We will follow-up post purchase to confirm. Over 6 weeks, we will help you to gain insight for easing into your practice by learning the foundations of breath, body & yogic philosophy. With the newest of yogis in mind, we introduce and work with the cultivation of mind-body connections proven to have a profound positive effects in all your life’s areas. Sharing is caring. Grab 2(two) 10 Class Cards for the price of one! For recipient of 10 Class Card we need to create a profile and add it: Please email register@yogasamatva.com the following. BEST FOR: The unknown + workshops! These gift cards cannot be used towards the purchase of alternate Black Friday deals.